Map scale description: A scale bar of 4" - 10 [miles] is included. This is a map of the opposite borders of Scotland and England. It is from an atlas that belonged to William Cecil Lord Burghley, Elizabeth I’s Secretary of State. Burghley used this atlas to illustrate domestic matters. This map is interesting because it shows the debatable lands, these were lands between the borders of Scotland and England, claimed by neither and subsequently a lawless no-man’s land. Lord Burghley has annotated the map, adding place names at points along the river which forms part of the border, and the river immediately to the right of this which lies on English soil. 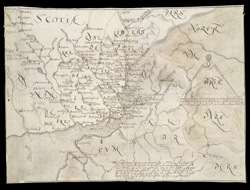 The title, "A Platt of the opposete Borders of Scotland to ye west marches of England" appears on the reverse with the date: "Dec. 1590". There is a description on the map itself which ends: "for those on the English coast they ar referred to the tract latly sent to your L. of the description of them in particular". A scale bar of 4" - 10 [miles] is included.